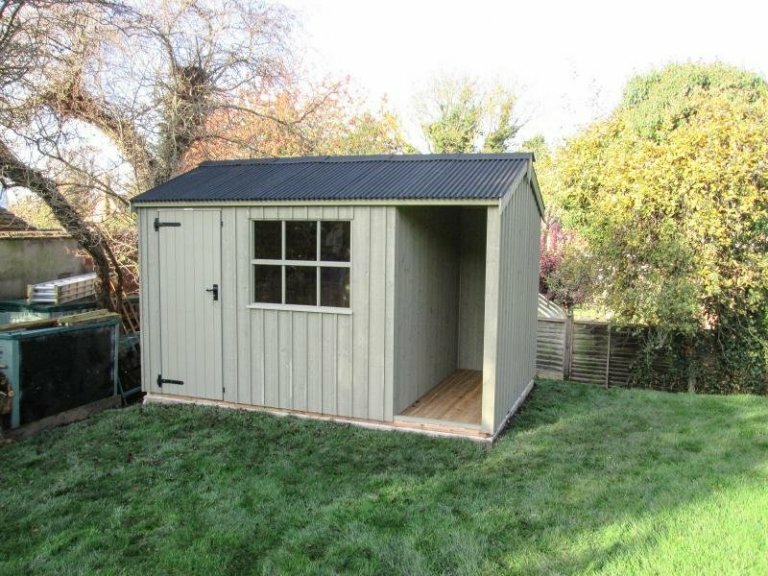 This 2.4 x 3.6m National Trust Blickling Garden Shed has been installed in our customer’s country garden in Stratford-upon-Avon, Warwickshire to use as a helpful storage shed. While we call the open section of the Blickling a logstore, many of our customers use it to store other items in as well, such as larger tools or wheelbarrows that aren’t affected by being out in the open. As you would expect with anything designed in conjunction with the National Trust, the range of garden buildings are traditional in style, with Georgian windows, black cast iron door furniture, roughly cut vertical sawn boards for the external cladding, and a corrugated sheeting on the roof. 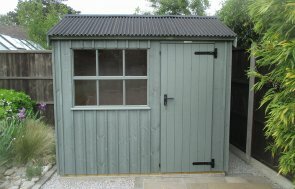 The paint colour the customer chose for their shed is Wades Lantern, which is one of the six natural colours that you can choose from our National Trust paint range. If you like the traditional style, a National Trust Shed maybe a great choice for you. 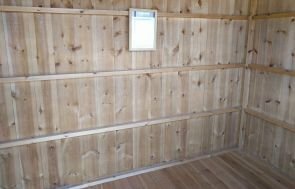 If, however, you are after something more bespoke, you can have a look at our Superior Shed range, with its extensive range of sizes and style options. For more information, please call us on 01760 444229, or come and visit one of our Show Centres to see our buildings and to discuss your building requirements with us.